We have identified Swift Record as an adware app, and thus we recommend that you remove it as soon as you notice it on your computer. Developed by SuperWeb LLC, Swift Record is a completely useless browser extension which promotes third-party content onto Internet browser. Though Swift is compatible with Internet Explorer and Mozilla Firefox, the newer versions of Google Chrome might block this application; hence, this is the first sign that you should delete Swift Record right now. Also, you should consider the method it employs to enter to your system; i.e., it is distributed the same way unwanted or dangerous programs reach target computers. As soon as it enters your computer, Swift Record does everything an advertisement-supported apps supposed to do: It starts showing advertisements. It might pop up coupon and discount related information when you go to such online retailers as Ebay.com, BestBuy.com, or other. Swift Record will serve you ads even if you do not visit the said sites; i.e., this app might display the commercial content everywhere. The advertisements might be tagged by “Ads by Swift Record” or “Provided by Swift Record,” or similar phrases; therefore, if you already noticed the promoted third-party links, we suggest that you do not delay and remove Swift Record from your machine immediately. You should delete this application and for other important reasons: The promoted third-party links might reroute you to unsafe sites. Here, you might accidentally authorize the access of such threats as Trojans, worms, rogue software, ransomware, etc. The moment malware gets onto your system, it can compromise your machine in many unpredictable ways; thus, removing Swift Record should be on your priority list. If you do not want to deal with Swift Record in the first place, you should avoid downloading software bundles from suspicious websites (for example, pirate sites). When you are installing torrent clients, media players, PDF readers, download managers, or other applications or utilities, there is a possibility that the installer (or the downloader) might deploy additional components onto your machine as well. This is a common way for risky content to find its way to computers. Common sense and vigilance are the most trusted preventative measures; all you have to do opt for more customizable installation process (Custom/Advanced) and uncheck suspicious applications. Even if Swift Record has already reached your computer, it might still not be too late to remove it. As with Pine Tree, Air Globe, Special Box and other Superweb applications, you can terminate Swift Record completely by deleting it from Control Panel. To make sure your computer has not been infected with additional threats, which sometimes are hard to detect, install legitimate antimalware software. The tool will work as a defensive wall against all the threats that might try to reach your system. 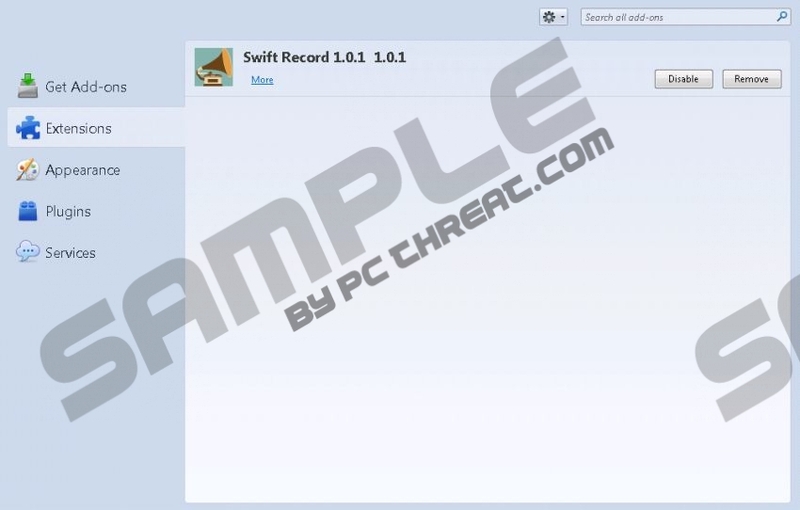 Choose Swift Record in the program list. On the left, Switch to Category View. Quick & tested solution for Swift Record removal.